Sam's Natural Deodorant Stick one very natural deodorant alternative. Right now, it is holding at 3.8 stars on Amazon and has mostly positive reviews. However, there are some reviews that need to be looked at. So, let's get right into the thick of Sam's Natural Deodorant Stick. Sam's Natural Deodorant Stick is, of course, a stick deodorant. Why is this important? Most people are more than used to the stick deodorant so this is obviously the most popular choice for people just getting into the natural deodorant game. Plus it is pretty much the best overall choice, as it both deodorizes and absorbs sweat well. Many natural stick deodorants are usually made up of a form of natural oil or butter, like shea butter, along with baking soda, or one of the other natural absorbents, and essential oils for the fragrance. In fact, there are several essential oils that are antibacterial by nature, like tea tree oil or neem oil. However, these are fairly strong scents and some may not like that. Inside Sam's Natural Deodorant Stick are a bunch of great stuff. There are not a whole lot of ingredients, but the ones it does have is all natural. 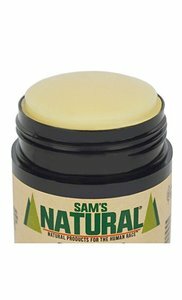 The complete ingredients for Sam's Natural Deodorant Stick are as follows: Sodium bicarbonate, coconut oil, candelilla wax, arrowroot powder, mct oil, pumpkinseed oil, shea butter, fragrance, rosemary leaf extract, carrot seed essential oil, tea tree essential oil, mixed tocopherols, aspen bark extract. Here, Sam's Natural Deodorant uses Arrowroot Powder as the absorbent ingredient. The coconut and MCT oil are used for their antibacterial properties, that help to kill the odor causing bacteria. However, there is one ingredient that is not natural. That is the fragrance. Otherwise known as parfum, this ingredient has been linked to skin irritation. However, one plus side about this ingredient is that Sam's Natural Deodorant Stick has said that while it is a synthetic ingredient, it is free of phthalates and sulfates. There are a lot of great benefits you'll be taking advantage of with this deodorant. For starters, those of you who are vegan, you may want to pay attention to this product because it is in fact Certified Vegan. In addition, it is also cruelty free. This means that this product was in no way, shape, or form tested on animals. Past that, for those who are environmentally conscience, Sam's Natural Deodorant Stick is packaged in 100% recyclable plastic tubes which feature a recycled kraft label printed with non-toxic inks. In terms of its effectiveness, many people have said that this has kept them dry and smelling good throughout the day. However, if you do not like this product, you can return it for a full refund hassle free, within 30 days. Sam's Natural Deodorant Stick does have some warnings about over application of their product. This is what they say on their Amazon product page: "A little bit goes a long way! Resist the urge to over apply, 1-2 light swipes is all you need. Over application is a common mistake which may cause a minor rash. If this occurs, we recommend reducing the application amount or discontinuing use. A small percentage of people may simply be sensitive to the ingredients in our product and unable to wear any amount; the most common being baking soda." So, just be sure to use only a small amount. Sam's Natural was founded in 2011 by a guy named Sam. The company was started with a natural hand scrub made from walnut. He wanted to create something that was powerful but did not have all of the harsh chemicals that commercial brands have. the very first product by Sam's Natural was Walnut Husk Hand Scrub. The mission behind Sam's Natural is to provide great personal care products designed for everyday life. Since their founding, they have stayed true to their focus of integrity, trust and transparency. All of their ingredients are sourced from trusted US suppliers and their products are all made in small batches to reduce risk of contamination. Now, they offer products besides the hand scrubber and natural deodorant. They also have specialty soaps, beard oils, skin care, and even soy candles. All of their products are certified vegan, cruelty free and free of any and all harsh chemicals including parabens, phthalates, sulfates, etc. Sam's Natural Deodorant Stick is a convenient way of converting from regular deodorant to a natural deodorant. This is because most people are already use to the style, design and feel of the stick deodorant. Plus, the stuff typically included in stick deodorants offer a larger range of protection than other types of natural deodorant. All but one ingredient in Sam's Natural Deodorant Stick are natural. Arrowroot powder and baking powder for absorbency, coconut oil and MCT oil for their antibacterial properties, and many more benefits. All of the products by Sam's Natural, including their deodorant stick, are great for animals and the environment. They are all certified vegan, cruelty free, and use recyclable plastic tubes and non-toxic inks. This stuff actually works. Many of the positive reviews of this product rave about how it has kept them dry and smelling good. Even the negative reviews that this product have, many say that it worked well for them. Their complaints were of a different nature. If for some reason you do not like this product, Sam's Natural Deodorant Stick offers a very nice 30 day hassle-free return. This return also comes with a full refund of your money, minus the shipping fee. So you can essentially try this deodorant risk free. Even though most of the reviews, both positive and negative have said that the product actually does work, there are some valid complains against the product. The most common complaint is that some users have said the product gave them a rash, or in some instances, big boils. Most likely, this is due to the baking soda ingredient, which many people are sensitive to. Sam's Natural actually tells people not to use a whole lot of this product as it can result in a rash. They acknowledge that some people are allergic or sensitive to baking soda and tell them that if a bad reaction occurs, to stop using the product. So, they actually care about your well being before their profits. That's nice. There is one ingredient that is rather disappointing to see featured here. That is fragrance/parfum. This has been linked to skin irritations like rashes. However, their fragrance oils are free of sulfates and phthalates, so there is that. Overall, this looks like a really great natural deodorant. As long as you are not sensitive to baking soda, you should find this product to be extremely helpful to you. However, it is best to check with your doctor about your sensitivity to baking soda before buying Sam's Natural Deodorant Stick or any other product that contains baking soda. Then again, you could buy this product and if you end up getting a rash, simply send it back for a full refund. Nevertheless, the ingredients are beneficial and natural. Even the synthetic ingredient is free of phthalates and sulfates. So honestly, it is worth checking out. All in all, this is a natural deodorant that we can definitely recommend. Just the fact that there are little to no reviews complaining about how it does not work is a huge plus. Many deodorants struggle with their effectiveness. This one, does not seem to have that issue. If you want to give it a try, risk free, you can grab any one of 17 scents, on Amazon, for $9.95. For more information on the best natural deodorants, head on back to Green and Growing. Here are some top questions that I found for people seriously considering buying Sam’s Natural Deodorant Stick. Is this deodorant a gel or solid stick? Sam's Natural is a solid stick. Does this leave any residue on clothing? It seems so, however it does wash out. Does this have a sticky feel after application? No, it dries after you put it on.